Ark LED FLood lights feature Philips Luxeon LED's and are powered by a Meanwell driver to provide a versatile and lasting LED lighting system. View the full range on page 9 & 10 of the brochure which you can download from this page. HYLUX takes advantage of the recent advances in optical and LED chip design to offer a versatile floodlight with exceptional performance. HYLUX is aimed at high mast area and stadia lighting applications. If you have doubted the performance of LED technology before now then you must take a deeper look into HYLUX before opting for outdated HID solutions. The Hylux Floodlight system is suitable for a vast number of applications from simple security or task lighting to high mast lighting and sports stadia lighting. 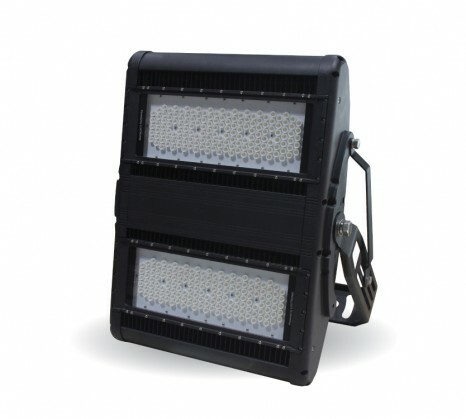 The Hylux high performance professional led flood light uses patented cooling technology which maintains a low LED chip junction temperature and thus delivers long life. Using the latest LED chips from leading chip manufacturer Lumileds & Cree, the Arrow floodlight offers a high lumen per watt value reducing your energy usage. With a choice of optics, we have a photometric footprint to match any application or requirement. We can provide photometric files for your own designers or can offer in-house lighting design to demonstrate the superior performance.